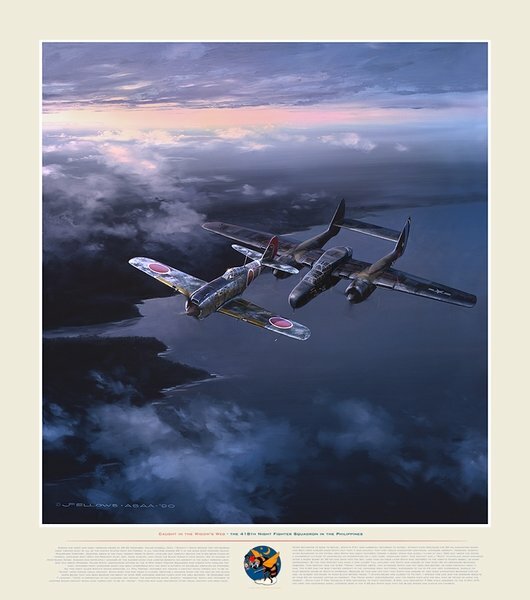 Paper Size: 24" x 27"
During the night and early morning hours of 29-30 December, Major Carroll Cecil (”Snuffy”) Smith became the top-scoring night fighter pilot of all of the United States Army Air Forces, in all theaters during WWII in the skies over Mindoro Island, Philippines Territory. Depicted above is the final moment prior to Smith leveling-out directly behind the Ki-84 being flown by Imperial Japanese Army 29th Air Regiment pilot, Sgt. Akira Kusano, and firing the Black Widow’s four deadly 20 mm cannon at point-blank range. Kusano was completely unaware of the danger, which was underneath his aircraft in the early morning light, one mile above Mindoro. Major Smith, commanding officer of the 418th Night Fighter Squadron was tasked with tackling the many Japanese night intruders, which had been interfering with the Army’s efforts to establish airfields on Mindoro. On this night major Smith’s radar operator, Lt. Phil Porter, vectored him toward a contact which turned out to be an “Irving” upon making visual contact. Smith shot this one down in flames, creating a welcome show for the men on the Allied ships below that had been bearing the brunt of over 400 Japanese sorties flown into the area between 18 December and 7 January (1945) in opposition to the landings and against the supporting ships. Shortly thereafter, Smith was vectored to another radar contact which also turned out to be an “Irving”. This one was also destroyed after visual contact had been made.